The San Francisco Chronicle took a close look at a phenomenon that has bewildered me for years. Across America, there are convicted killers sitting on death row. And across America are infatuated women who write to them in prison. Some send them gifts and money. Most become infatuated. And some of these sick puppies actually go to the prison and marry their incarcerated love objects. The San Francisco Chronicle reports as follows on the phenomenon of "Killer Groupies". There are various explanations for this sick phenomenon. The simplest is that these empty headed women are infatuated with "bad boys". Other psychological experts cite low self esteem. Some pen pals are from Europe, where the prevailing fashion is to sanctimoniously shake one's head at "American Barbarism". Some of these Europeans have even come here on psycho-tourism junkets, where they visit their death row heartthrobs. The phenomenon of gullible women answering lonely hearts ads from "misunderstood" prisoners is an old one. I once had a neighbour that blew $800.00 on "legal fees" for a man who was doing 20 years for manslaughter. It ended when she started corresponding with someone on his cell block. He threatened to kill her when he got out and she ended up having second thoughts about his "innocence". I think that there should be limits to the monetary value of "pen pal" remittances to those who are incarcerated. There should be a strict limit on gifts from prison pen pals. There should be a surcharge paid to a victim's compensation fund so that if someone sends say $100.00 to a prisoner who they met in prison, then they have to pay the same sum to a victim's compensation fund. The other solution would be to send a sultry picture of a buxom babe to some guy who is trolling for suckers. Send him a couple of cards and cheap trinkets. Then say you really want to meet him. On visiting day, have some 300 pound five foot tall dude with personal hygiene issues waddle into the visiting room with a cheap bouquet of flowers. When he sits down, he should pretend he is picking bedbugs out of his clothing. Then he should take out a Snickers bar, take a slobbering bite out of it and offer the other half to his penpal. To add insult to injury, he should then try to bum a cigarette off the prisoner. The existence of low life murderers who milk gullible women should not blind us to those who truly deserve our help and sympathy. People like freelance editor Doreen Lioy, who married serial killer Richard Ramirez in jail commit a double crime. They bestow mercy upon those who are totally undeserving of it, thereby spitting in the faces of the families of murder victims. Additionally, they shift attention away from those who truly deserve another hearing from society. Sorting out the innocent, the people who deserve punishment and a second chance, and those who have forever forfeited their rights to live as free men is not easy. But it must be done. Between gullible coddling and harshly turning a blind eye and a deaf ear to our nation's prisoners is a middle way. For our good as a society, we must find it. 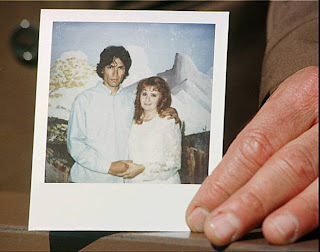 The picture at the top of this article is freelance editor Doreen Lioy and her killer hubby Richard Ramirez. When he gets the electric chair, she should be sitting in his lap.